I saw Moana in theaters back in December. My girlfriend and I took our six-year-old to see it. I had meant to review it at the time, but it sort of slipped through the cracks of a busy holiday schedule. Well, now the movie is available for digital viewing and is going to be released on home video on March 7th. I'm already having to sit through it again, and will probably have to sit through it some more, and the six-year-old has been insisting on listening to the soundtrack in the car whenever we've driven anywhere over the past month or two. And you know what? I don't have a problem with it, because I really like this movie (and its soundtrack). In the meantime, I've talked about this movie a lot. Everyone seems to like it, but I've found that I seem to like it for reasons other than the people who I've spoken to, which is why I decided to go ahead and write the review. Most people seem to enjoy Moana for its progressive feminist messages. This is certainly true. She is the heir to her village's chiefdom, and this fact is taken completely for granted by the community. No one seems to question her ability to lead or her claim to authority based on her gender. Her ascendancy to authority (or a villain trying to prevent that ascendancy) isn't the central conflict of the movie. She isn't looking to marry in order to legitimize her claim, nor is anybody trying to marry her in order to usurp her throne. The idea of a woman being chief seems completely normalized in this society. There's no reason to believe that this village hasn't already had female chiefs (perhaps Moana's grandmother was a chief? ), nor does anyone seem to think it would be unusual for the village to have a female chief in the future. The dispute between herself and her father are more ideological and practical, as she's drawn to the ocean by her desire to explore, while her father is committed to remaining on the island where it is presumably safe. Moana is an excellent female role model, though at the cost of Maui being reduced to a narcissistic jerk. There's also no silly or forced romance subplot, which is a huge deviation from the norm for the Disney princess archetype (and Maui even jokes that Moana is a princess). There's no romantic or sexual tension between Moana and Maui, nor does Moana feel any pressure to find love in order to make herself whole or validate her authority as village chief. She is a completely independent person. It is a shame that her strength as a character has to come at the expense of Maui (a beloved figure in the mythology of Polynesia) being portrayed as narcissistic jerk for most of the movie. But he does redeem himself at the end and is still a likable character. The feminist and female empowerment messages are all well and good. But I think that my favorite element of the movie is that there's no traditional villain. There's a few incidental antagonists, but no central villain who directly opposes the heroes throughout the movie. There's no Maleficent, no Scar, no Jafaar, no Prince Hans. The big bad monster at the end of the movie is the closest thing the film has to an overarching villain, but even that isn't so much a genuine villain, as it is simply a misunderstood force of nature (and a rather obvious metaphor for human-induced climate change and ecological destruction). There is no true, singular villain. The big, bad monster at the end is more a misunderstood force of nature. Moana's central conflicts are person versus self and person versus nature. 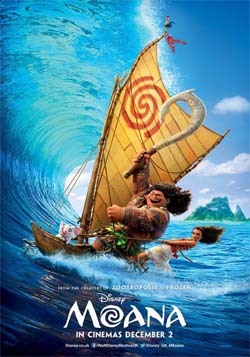 Moreso than defeating a villain, Moana and Maui both have to overcome their own personal lack of confidence and trust in each other in order to rectify their own past mistakes (well, Maui's past mistake...). Aside from the two incidental encounters with antagonists, the rest of the challenge is simply overcoming the unforgiving and treacherous ocean in order to find their way to Te Fiti (and overcome the aforementioned force-of-nature-manifest-as-monster). Heck, if I had to pick a villain, Maui would actually be the lead candidate! It's his past transgression that set the whole mess in motion, and he's the one who stands against Moana until she can convince him to have a change of heart and take personal responsibility. The writers of the next Star Trek movie should take a close look at Moana's screenplay (along with the screenplay for recent sci-fi movies like Arrival and The Martian) for inspiration for how to make a "man vs nature" story that isn't dependent on a shallow villain! If Moana has any weaknesses as a movie, it would be that certain plot points seem underdeveloped. While I praise the movie for not having a central villain, the antagonists that do show up seem to come out of the blue. The Kakamora (coconut people) and Tamatoa (the shiny crab) are never mentioned before their appearances, and they're never brought up again once their set pieces are over. Ironically, the David Bowie-esque musical set piece involving the giant crab Tamatoa is actually my favorite song and sequence from the movie, so clearly this complaint isn't anything close to a deal-breaker. In fact, it actually provides a considerable amount of characterization for Maui. The musical number by Tamatoa is my favorite part of the movie, but kind of comes out of left field. Speaking of the movie's music, it's all great. Usually, a Disney movie has one good song and a bunch of mediocre, forgettable ones. This soundtrack, however, stands up next to Beauty and the Beast, The Little Mermaid, The Nightmare Before Christmas, and The Lion King for being loaded with memorable songs. The entire soundtrack for Moana is excellent and has a very broadway feel, which makes sense considering that Lin-Manuel Miranda (of Hamilton fame) worked on some of the music. The music is very high-energy and powerful. The lead actress Auli'i Cravalho has a perfect broadway singing voice, and who would have known that Dwayne (former professional wrestler "The Rock") Johnson could sing? "See the line where the sky meets the sea, and it calls me" is a wonderful motto for any explorer or naturalist, and that song may join Pocahontas' "Colors of the Wind" as an anthem for conservation and naturalism. So yeah, I really like this movie. It stands up along with The Lion King, Aladdin, and A Goofy Movie (I'm a bit of a sucker for father-child bonding flicks) as one of my favorite Disney features, and even competes with the Pixar masterpieces like Toy Story and Wall-E (unfortunately, I still haven't seen Up). And I'm sure that I'll happily sing along to You're Welcome, Shiny, and How Far I'll Go with the six-year-old in the car (and in my head at work) for months to come.